Mmmmmmm, magazines. They’re glossy and portable. You can roll it up, and tear stuff out. You can recycle it, dog ear the pages, even make a collage. They come personalized – with your name right there on the front, delivered to your doorstep. They’re full of stuff that you want to know, already know, should know, and sometimes wish you didn’t know. Someone worked hard to make it and get it out to you, and they cared what it looked like and maybe back in the day, they were a journalism major, and now they are worried about the future of the printed word. They’ve seen ad pages decline, and though I’m betting these fine people love the Internet, I’m pretty sure they curse it too. My lifelong relationship with magazines started innocently enough when I was a girl. I’d find every hidden picture, and read every kid-submitted poem in Highlights. Of course the jokes in Readers’ Digest were BRILLIANT. Then things got a little dark and gritty as my relationship with magazines got complicated. The problem really started with Seventeen, and the now defunct teen mags Young Miss and Sassy. That’s when I was brainwashed into the thinking that pretty much every teen girl had a boyfriend and flawless skin and could easily fill out a strapless formal. I quit those, and opted for Newsweek and the since-shuttered TAXI, aimed at urban sophisticates. I skewed the demo for each. I would be the first in my family to pick up Newsweek and read it cover to cover the day it came in the mail. My knobby knees would be slung over the side of the armchair, and my thumbs would be black from the ink on the cover. I’d proudly point out to my Dad that week’s Conventional Wisdom, cut out the few political cartoons I understood, and would nod solemnly with earnest concern as I stumbled through the meatier stuff in the middle. I was quite certain that this would impress my celebrity crush – Tom Brokaw – if I were ever to meet him. I’ll never forget walking home with a classmate the week Leona Helmsley was the Newsweek cover girl. “The cover just says ‘Rhymes with Rich’ over her photo…Isn’t that awesome?….Get it? ” She looked at me like I was a major disappointment to our species then excused herself, suddenly remembering something she had to do elsewhere. 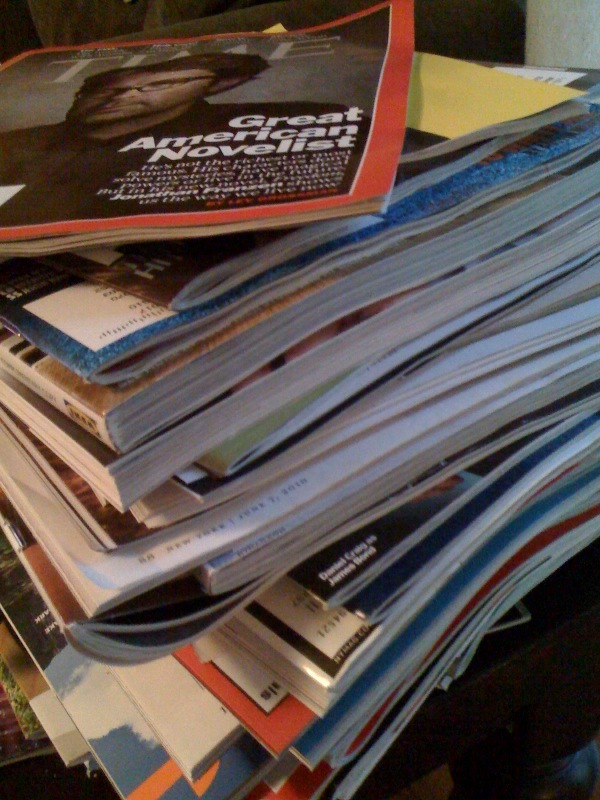 My adulthood garnered a number of short-term magazine relationships ….in retrospect, all fairly reflective of my stages in life: Elle, Rolling Stone, Spin, In Style, Biography, Cooking Light, Wired, People, Business 2.0, Real Simple, Entertainment Weekly, Parents, Bon Appetit, The Economist, Vanity Fair, Guidepost, Travel & Leisure and Time. My longest relationship so far is with Sunset, an annual gift from my brother and sister-in-law. I half expect to know someone every time I turn a page in Sunset. A couple of years ago, I yelped when one day I did turn the page and there was my neighbor, smiling and sitting in her very sleek Sunset-worthy kitchen. Most of my magazine break-ups were undramatic, ending with me lazily letting my subscription expire… we simply grew apart. There were a couple of noteable and glorious flameouts though. People Magazine and I spent a lot of time together right after Jacob was born. There were issues spilling out of the pockets of the rocking chair in the baby’s room. I’d devour it shamelessly until one day, it turned out to be pretty shameful. As I finished the issue, simple crossword and all, I looked up to realize I’d absolutely ignored my baby for who knows how long, leaving him in the jumpy saucer until he was in a trance. I broke up with People right there, for the sake of my children and children everywhere. Years later things got pretty hot & heavy with Vanity Fair. The pages are made from the most luxurious high quality paper in the universe – so shiny and glossy you just want to wrap yourself in it. The writing is superb – as if each word inside was penned longhand by someone smoking a cigarette in the bar at the Algonquin, wearing heavy spectacles and cursing me under his or her brandy laden breath while running their weathered hands through a head full of wild and unkempt hair. However, after each behemoth issue, I was utterly depressed. It was Seventeen all over again. Only instead of ill- fitting prom dresses I was up against “bright young things” who were all well traveled, well heeled, overly educated, perversely accomplished, and somehow actually saving the world. I walked out of that relationship in the night with nary a note, bitter, jaded and unsure if I could ever love a publication again. I wish I could tell you who introduced us, but I did in fact meet one. New York Magazine, NOT to be mistaken for the New Yorker. The crossword puzzle is hard, but not too hard, falling somewhere between People and The New York Times. All the cool stuff I’m proud to know about art and music and interesting people – I get from this magazine. The writing is clever and smart, approachable but not pedestrian. It doesn’t depress you like Vanity Fair, or embarrass you like People. It’s 2 hours well spent. I read every real estate ad for a city I will likely never live in, and every restaurant review for places that will most certainly be closed by the time I ever get back there. I can happily report that my magazines and I are in a healthy place…they are well balanced and forgiving, not at all needy or demanding – I’m entertained and educated and allowed the space and time to be independent and my own person. By the way, I did meet Tom Brokaw once when I was in college…I can’t say that he was entirely impressed. I finally decided to see what this Fulcrum Chronicles was all about. You are sooo funny. Reading this makes me feel like we are having an actual conversation about well… nothing and everything. I miss that. Nowadays, when we see each other, we are too busy trying to catch up to have silly conversations. BTW – my favorite is the one about the MLB throwing up. I feel Jake’s pain. There are no heroes in sports, just athletes.